When Nick Watney wants to avoid a hook, he tries to hold the clubface open by not letting his right wrist uncock all the way. Most players don't hit straight shots very often; to do so, their swings have to be almost perfect. Curved shots are easier to repeat than straight shots. There are two basic types of curving shots – one curves to the right and the other to the left. 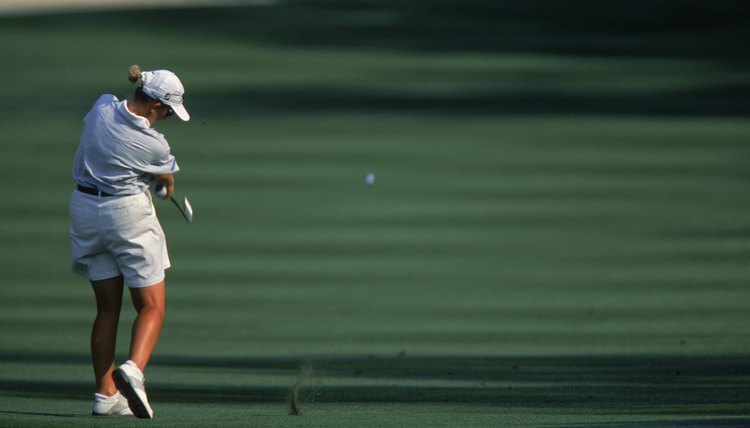 The words "slice" and "hook" generally refer to shots that curve a lot. Sometimes you want to hit a big slice or hook – perhaps to get around a tree – but usually you just want a little curve. A little slice is called a fade, and a little hook is called a draw. Imagine you're standing inside a circle when you hit your ball. If the ball curves around the circle (and you), that's a hook. If the ball curves away from you, that's a slice. Nick Dougherty makes a flat swing to keep the ball below a tree branch. There are three factors a player controls to help shape a slice or a hook. The first is the club's angle of attack. If the player makes a flat swing and tries to keep the clubhead as close to the ground during the swing as he can, the ball is more likely to fly low and hook. 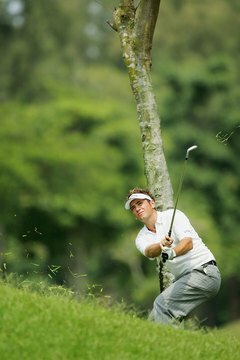 If the player makes a very steep swing so he makes more of a chopping motion at the ball, it's more likely to jump up into the air and slice. The second factor is club path, which often determines the angle of attack. It's hard to keep the club traveling straight down the target line when the club hits the ball; it's usually crossing the target line at impact. If the club crosses from your side of the line toward the outside, that's an in-to-out path and helps the ball hook. That might sound backward, but in-to-out paths usually have flat angles of attack that help the ball spin toward the player and hook. And if the club is moving from outside the line toward the player, that's an out-to-in path. Out-to-in paths usually have steep angles of attack and help the ball slice. 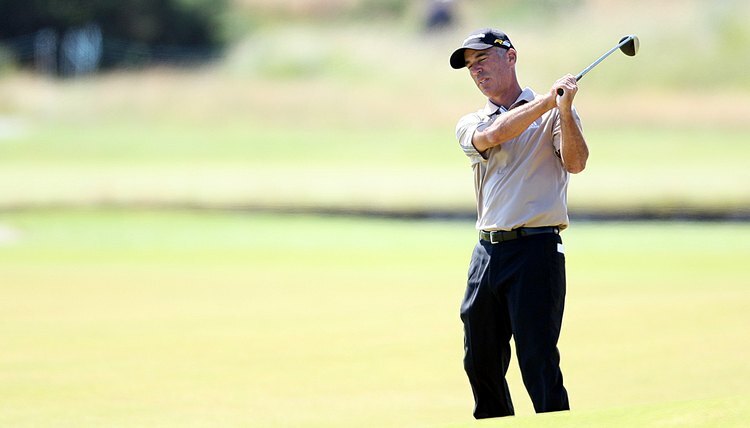 Corey Pavin turns the clubhead hard to the left as he tries to make the ball hook. The third factor is the face position. If the face points straight at the target when the club hits the ball, that's a square clubface. If the clubface points to the player's side of the target line (to the left for a right-handed player), that's a closed clubface and the ball tends to hook. And if the clubface points to the opposite side of the target line (to the right for a right-handed player), that's an open clubface and the ball tends to slice. These three factors combine to make hooks and slices. Here's how it works: If you swing on a flatter in-to-out swing path with a closed clubface, you get a hook. If you swing on a flatter in-to-out swing path with a square clubface, you get a draw. 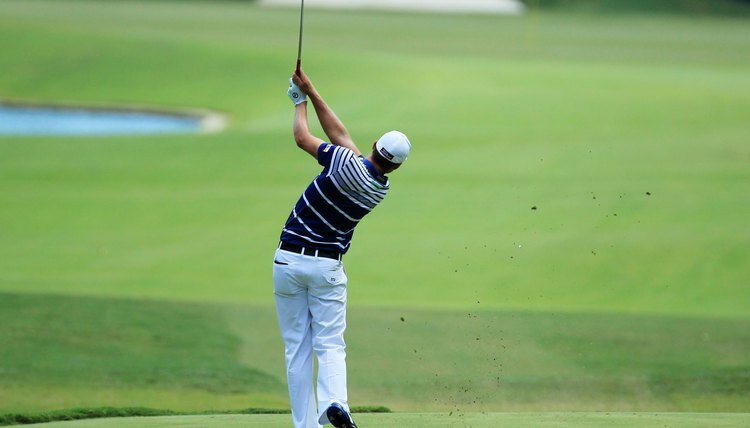 If you swing on a steeper out-to-in swing path with a square clubface, you get a fade. And if you swing on a steeper out-to-in swing path with an open clubface, you get a slice.